I can't get to the pattern for this hat. Why isn't it by the picture like all the others? Read the line right under the photo, it tells you where the pattern is. Nothing but the picture of this hat shows up, I can't get a pattern from the right side bar, please help, this is too cute too pass up for my grandson!! I am a beginner of knitting and am addicted already! The hat uses the Roll Brim Hat pattern, as it says under the photo. 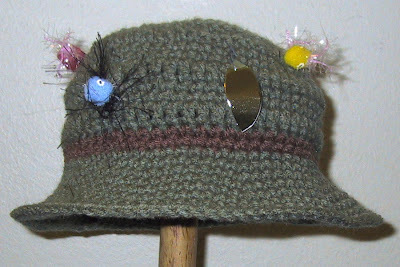 Love this - but when I click on the link to the right it takes me back to the directions for the embellishments, not to the directions to crochet the hat. Can you help? Thanks. You need to click on the Roll Brim Hat - Child's.